Wells-next-the-Sea is an unspoilt seaside town on the North Norfolk coast. 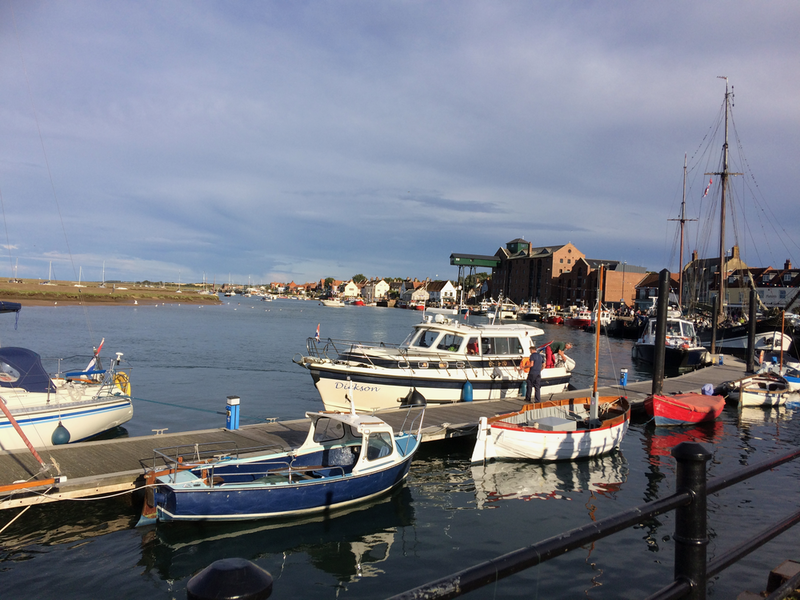 The Quay area is busy with an active fishing fleet, a sailing club and holiday makers gillying (crabbing) on the quay wall. There are a variety of harbour and fishing trips available. The Dutch sailing barge, the Albatross, is one of the oldest sailing ships still afloat and is now permanently moored in Wells Quay. It serves sweet and savoury pancakes and has a bar with regular live music events. There is a large play area for young children and a skate park for older children nearby. Shops, an amusement arcade, tearooms, restaurants and two fish and chip shops line the Quay. The main centre of Wells-next-the-Sea is set behind the Quay. The town is a delightful network of old narrow streets and ancient buildings. The unique shops on Staithe Street bustle with shoppers and browsers. There is a diverse selection of small and friendly shops selling everything from buckets and spades, to fresh produce, books and paintings, high end clothes and designer gifts. The restored Grade II-listed former Maltings building has been transformed into the Wells Maltings Arts Heritage and Community Centre. It offers a wide variety of entertainment and information including a heritage exhibition, theatre, cinema, various art exhibitions, a cafe and visitor information centre. The Buttlands, near to the top of Staithe Street, is a quiet green, lined with trees and elegant Georgian and Victorian houses. The Crown Hotel, a former 16th century coaching inn and the Globe Inn can be found here. The large unspoilt sandy beach is a 20 minute walk along the Bank, or a short train ride on the narrow gauge miniature railway which runs from the end of the Quay to the beach. There is a large beach car park and a café which serves snacks, drinks and ice-cream. Brightly coloured beach huts line the beach which is backed by pine woods. The Lifeboat Station at the back of the beach, often open to visitors, has a collection of items illustrating the history of the Wells Lifeboat. Behind the pine woods is Pinewoods Caravan Park and Abraham's Bosom. There is an outdoor leisure area by the side of a natural 5-acre boating lake, where canoes and rowing boats can be hired. The wide, sandy beach stretches along the coast for about 2 miles towards Holkham Bay. This picturesque bay was featured in the film "Shakespeare in Love" and is popular with horse riders. 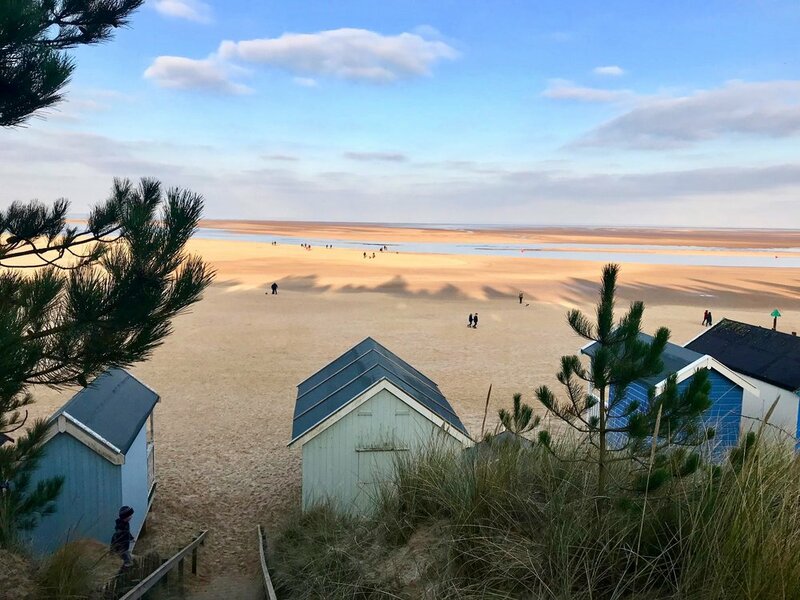 Holkham beach is a popular place for bird watching and has two bird hides overlooking the marshes at the back of the pine woods where geese and other wild fowl can be seen. With its pinewoods, salt marshes and sand dunes, the coast attracts bird watchers to view the bird and animal life throughout the year and to enjoy the rich flora and fauna. Oyster catchers, ringed plovers, common and little terns are all regular visitors to the area. Wells is the perfect base from which to explore this area of outstanding natural beauty and experience the wide variety of local attractions. There are beautiful walks along the Norfolk Coastal Path and Peddars Way, which is also suitable for cyclists. Cycle hire is available in Wells next-the-Sea and at Holkham Hall. Holkham Hall, an 18th century stately home, is a 5 minute drive along the coast road or can be accessed via the coastal path. Set in rolling parkland it offers a host of attractions and events. 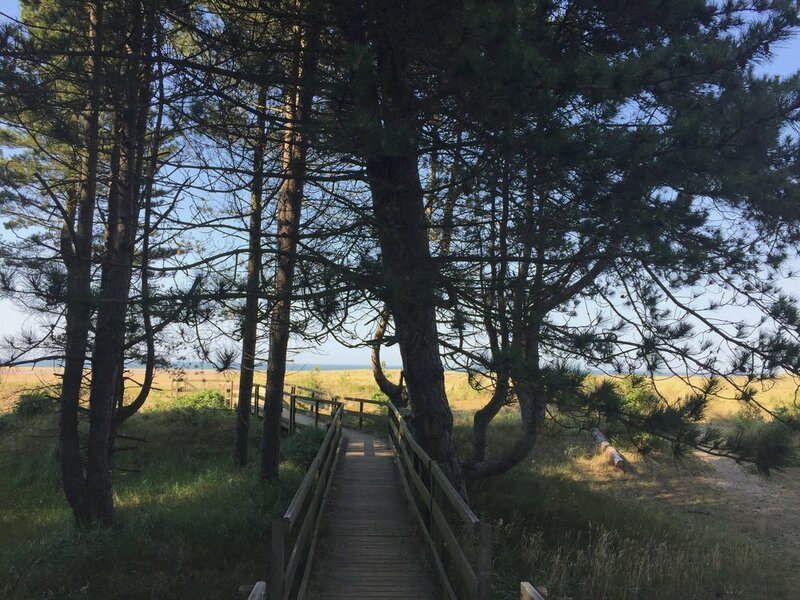 Access to Holkham beach is via the pretty tree lined Lady Anne’s drive where you will find the Lookout, visitors centre with a small cafe. Creake Abbey, a ruined Augustinian Abbey, can be found 7 miles inland from Wells and has a food hall, shops and studios. Walsingham, 5 miles away, has been a place of pilgrimage since medieval times and is linked to Wells by the Wells and Walsingham Light Railway, a miniature steam railway. Blakeney is 8 miles away, where you can take a boat trip to Blakeney Point to see common and grey seals at the largest colony in England. Thursford museum, 9 miles away, showcases a collection of steam engines, organs and fairground attractions. Cley Marshes and Titchwell Marsh Nature Reserve (within 10 miles) are some of the finest bird-watching sites in Britain. Pensthorpe Natural Park, 11 miles away, is a natural woodland and wetland with an abundance of wildlife. Holt is an attractive Georgian town 12 miles away. It has a wide variety of shops, including antiques, a large department store and a bakery and restaurant. The scenic heritage steam railway connects Holt to the traditional seaside town of Sheringham. Royal Sandringham House and Gardens is just over 20 miles away. There are National Trust and other historic houses that can be visited in the vicinity including Felbrigg Hall, Houghton Hall, Blickling Hall and Oxburgh Hall.